Sen. Angus King (I-Maine) carries these laminated cards around with him. 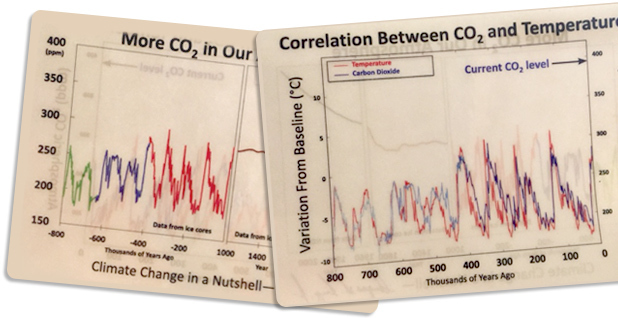 One side details the correlation between carbon emissions and temperature, while the other illustrates CO2 levels over the past million years. "It's all you need to know," he said yesterday. Photo by Geof Koss. For Maine independent Sen. Angus King, answers about the basic science of climate change are just a pocket away. The former governor has carried copies of a plastic laminated card in his pocket for the past several years. One side details the rise of carbon dioxide levels in the Earth's atmosphere over the last 1 million years, and the other the correlation between CO2 and temperature. "It's all you need to know," King said during an interview yesterday. His "Climate Change in a Nutshell" cards came in handy yesterday when he appeared on a panel discussing U.S. energy policy sponsored by Politico that also featured West Virginia GOP Rep. David McKinley. McKinley -- who is an honorary board member of the Alliance to Save Energy, a member of the Energy and Commerce Committee, and a fierce advocate for his state's battered coal industry -- did not dispute the existence of climate change. "Look, I'll be the first person to tell you I believe in climate change," McKinley said while discussing the challenges coal faces in the modern age. "As an engineer, that would be absurd for me to say it's not occurring, when 150 years ago the oceans were 8 inches lower and the temperature was 1.4 degrees cooler. I understand that," McKinley said. King stepped in when McKinley repeatedly blamed coal's demise on regulatory policies and later again questioned its contribution to raising global temperatures. The West Virginian said: "It's just too simplistic sometimes to try to figure out that this is fossil-fuel driven, that it's carbon-driven." King responded: "It's unclear what you're saying. You're saying you accept the reality of climate change, but you don't think it's connected to carbon?" As McKinley segued to highlighting the lack of power in the developing world and the potential for coal to help electrify the planet, King interjected again. King asked: "Do you not believe that global climate change is attributable to the burning of fossil fuels?" McKinley responded: "I think only 4 percent of the CO2 emissions are anthropogenic. Ninety-six percent is naturally occurring." King then pulled one of his cards from his pocket and handed it to McKinley, who accepted it. "I'm going to share this with you," King said. "That's a million years of CO2 in the atmosphere, and in 1860, it went up by 25 percent. Something happened. It wasn't volcanic. You can keep that." It's not the first time King's card has come in handy. During a 2014 appearance on the show "Real Time With Bill Maher," King gave a copy to the host. King had the card made when he got to the Senate in 2013. A November 2014 letter posted on the senator's website offers a more detailed explanation of the graphs on the card. Most of the data come from glacial ice cores taken from Greenland and the Antarctic, with measurements from climate stations at Mauna Loa in Hawaii and elsewhere providing the context for recent readings. "I frequently discuss the changes that are already afoot, and what might come in the future, with other politicians, business leaders, innovators, community leaders, and people I run into on the street," said the letter, which also contains links to the full data sets. While McKinley and Bracewell LLP attorney Scott Segal argued for the benefits of fossil fuels in providing baseload power, King got the last word. "We're also driving what may well be the greatest environmental catastrophe in the history of the world," he said as the panel discussion ended.